Please note that this is not a political post and this site remains unpolitical. It is aimed at giving useful information to travellers and cannot be relied upon totally as the situation is constantly developing. In light of the recent developments in the Gaza Strip, the question running through the minds of many people planning to visit Israel is whether it is still safe? The answer, you will be pleased to hear, is that yes it is. The affected area in Israel is about a 30 mile radius of the Gaza Strip. It isnt an area which many tourists visit anyway, and there really isnt much on the site which recommends visiting this area. The US, UK and Australian governments, as well as many others, keep citizens up to date with travel advice on their sites. At the moment, there is no change in the general level of advice in travelling to Israel from any of these governments. We follow the advice which is clearly posted on these sites, and advise that you continue to check here, links can be found at the bottom of this post. We feel that it is important though, to remember that you are still safer in Israel at a time like this than in almost anywhere in the USA in a statistical sense. We hope you continue to plan and look forward to your visit to Israel, where we hope you'll have a really cool time! Each year the ultra-cool Conde Nast concierge.com, names its 'It List' of the places which in two years time will be on the tip of your tongue. In other words, the next mega-cool travel destination. And you've guessed it, not only did Tel Aviv, make it onto the list, but it topped it. Second post of the day, wow! They say news comes in phases, and we have just heard some more great news, El Al is starting flights next year to Sao Paulo, Brazil. These will be the only direct flights operating between the continent of South America and Israel, and comes at a time when airlines are generally cutting back their networks rather than expanding them. Adding the 14 and a half hour flights shows that Israel is bucking the trend, and attracting people from across the world seeking a cool, historic, and culturally astute destination. The only continent left to serve is Australasia - and we sure hope it will come soon - we can tell that loads of people want it! Tel Aviv has finally got the buzz. We all know its a great city but why now? This article from Ynetnews tackles these questions about the Tel Aviv brand, which is clearly associated with cool! It is somewhat out of the ordinary for the New York Times Travel section to devote three feature articles to a single city within a three-month span. It would be even more surprising if the pieces focused on a city other than the world’s established tourist capitals. Yet, it has happened - to Tel Aviv. Last month, the Times devoted an additional article to Tel Aviv, noting that it has become one of the world’s cultural capitals, especially for the plastic arts. This article joins a stream of pieces, published during the past year in leading American newspapers and magazines, which paint Israel - particularly Tel Aviv - as the “next hot destination” for culture, lifestyle, tourism, fashion, and architecture. Why Tel Aviv? Why right now? There’s no one easy answer. Instead, a number of factors have contributed together, the most important being a realization that the city delivers on - and even exceeds - the promise that its brand name conjures up. Those of us responsible for promoting Israel’s image currently face a dilemma: Do we invest our limited financial resources in improving American public opinion, which already recognizes and values Israeli culture and lifestyle? Or, are we better off devoting these resources to locales where our national image takes a beating on a daily basis? This dilemma takes on greater significance during a period like the present economic downturn. Many of the organizations that have helped us previously are themselves facing a crisis and have cut back on their contributions until the storm passes. These organizations allowed us to work not only in the field of public diplomacy, but also in promoting topics that portray Israel as a normal, vibrant, and modern society. The coming year marks Tel Aviv’s centennial, an occasion that provides an outstanding opportunity to cover the city’s cultural and lifestyle offerings. To those responsible for Israel’s image, Tel Aviv represents much of what we want the world to know about us, but of which many remain unaware: The city is cosmopolitan, multicultural, trendy, chic, modern, intellectual, young, and open. A successful brand has two elements: “trend” and “buzz.” The meaning of these concepts is simple: In order for a branding project to succeed, people need to talk about it (“buzz”). As more people discuss the brand positively, the brand name gains enough traction to exist on its own (“trend”). The same thing is true about the “Tel Aviv” brand. The city is already on the world map. The current challenge is to keep people talking; journalists need to keep up the stream of articles, and leading cultural and lifestyle figures need to continue visiting. Only by amplifying the “trend” and “buzz” around the brand name of Tel Aviv can we ensure that at some future point the city - and thereby Israel as a whole - will become a brand name that can stand on its own. In addition, an investment in the “Tel Aviv” brand name at the present time can also bear fruit in the short term. Our target audience is the “sophisticated segment.” Members of this population sector have high buying power and are constantly searching for new and promising destinations for tourism, culture, and lifestyle. Members of this “sophisticated segment” have maintained their lifestyles and remain consumers of all forms of culture, despite the economic crisis. Our hope is that a day will come when the City that Never Stops will join the ranks of cities like Paris and London, which need no reinforcement of their status as global cultural capitals. It is imperative upon those to whom Israel’s image is important to bring the innovation, creativity, and culture that characterize Israeli society to the attention of the public the world over. A new indoor ski resort is being built in Israel! 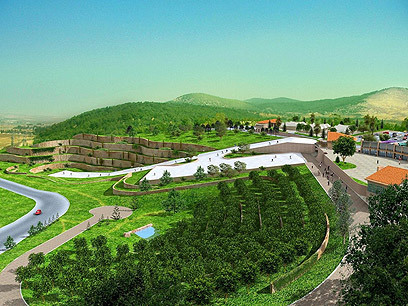 The resort is at the foot of Mount Gilboa in the Galilee and will have 320 meters of illuminated ski tracks, a cable car, a ski school for children and adults and a commercial center. What's more is that it will be open all year round from...late 2009! Here's the picture provided by the developers, although here it looks like its outdoors! It looks really cool and we just cant believe it will be open from next year! They say it will also be open at night and the summer! Wow, we really will be cool in Israel! What is the point of a site if we are the only ones contributing? Im currently working on selecting the best places to eat and stay in Israel...we have our opinions, but what are yours... If you have any, please let me know (contact@touristisrael.com)! Especially in Tel Aviv where there are soooo many good places to eat, we just cant pick out which are best - its a big problem! Also, if you have any ideas for anything on the site let me know please! In other news, Israel has officially had a record year for tourism. Zach Braff and Ben Stiller have been here in the last two weeks, and the Pope is planning his trip here for May, so what are you waiting for! Until next time, be cool in Israel!